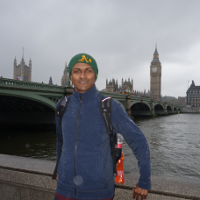 CHP alumnus Ravi Valleti (Ravikanth Gudlavalleti) exemplifies the multifaceted interests and abilities of CHP students. After graduating from UC Irvine in 2002 with a B.S. in both Aerospace and Mechanical Engineering, Ravi began to reevaluate available career prospects and decided to reconnect with acting, which he had enjoyed while growing up. A friend connected him with a film director, which led to a supporting role in the short film, “Next Round,” that went to the Cannes International Film Festival in 2008. More recently, Ravi has played supporting roles in two feature films: “A Leap to Take” and “A Bridge to a Border.” In “A Leap to Take,” Ravi plays ‘Govinda,’ an enigmatic Tantric spiritual group leader. This film premiered at the 2013 Moscow International Film Festival. In “A Bridge to a Border,” Ravi plays ‘Dr. Ray Satyajit,’ a frustrated psychiatrist for veterans returning with post-traumatic stress disorder. This film premiered at the 2014 Mill Valley Film Festival. He has also played a lead actor role in the feature film “Devised” as Wall Street attorney ‘Othello Khan, Esquire.’ Alongside his acting, Ravi is also the author of his upcoming ‘Posthuman Memoir’ called “Rocket Scientist” and is a March for Science volunteer advisor, speaker, and facilitator on #MarginSci equity and justice in STEM. His CHP experience serves as a foundation: “The wide breadth and depth of academic subjects that I was privileged to study and debate in intimate settings while at UCI give me range of material to access in creating my acting characters, in my writing, and in developing my ideas as a futurist.” The CHP was his home within the larger UC Irvine campus and he encourages current students to avail themselves of the amazing academic variety and opportunities offered in the CHP and at UCI. In his spare time, Ravi loves to travel. He visited the UK and the Republic of Ireland this past April. He also enjoys visiting friends and family in various locales, hiking, attending sporting events, and watching science fiction shows/films. You can keep up with Ravi’s work via his website www.ravivalleti.com.